colleges, administrators, teachers, and parents. Power-packed and interactive, our educational workshops addresses issues of self discovery and awareness, interpersonal skills, critical thinking, rising above adversity, making smart choices and developing attributes of kindness, compassion and determination. We are dedicated to the ultimate success and well-being of each student. 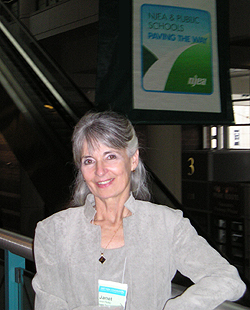 Janet is an NJEA Registered Provider who specializes in bullying, anger management and conflict resolution. A dramatic reduction in anger. Address and resolve issues of bullying. A greater ability to resolve conflict permanently and amicably. Develop healthy self-esteem and confidence. Acquire the necessary skills for critical thinking. Face and overcome adversity with greater ease. An increase in cooperation, kindness and concern. A decrease in hopeless, despair, and self-destructive behavior. An atmosphere of security and safety that fosters learning. The desire and ability to set and achieve extraordinary goals. A comprehensive, profound and innovative new approach to Anger Management. Discover critical skills and creative strategies for successful conflict resolution. A compelling approach to the issues of bullying and victimization and how to resolve them. Turn thoughts of despair and hopelessness that can lead to self-destructive behavior into positive life-affirming choices! Create safe and healthy relationships from the get-go and avoid unhealthy anger, abuse and danger. Instill attributes of compassion, kindness, appreciation and gratitude in this year long kampaign of school-wide activities. Raising Confident, Capable, Compassionate & Caring Kids - Essential lessons, values and skills. Learn to Recognize and Overcome Eating Disorders - Anorexia and Bulimia. Everything You Need to Know About Rumors and Gossip. Build Self-Esteem, Self-Confidence, and Self-Image! Fulfill Your Dreams: How to Achieve (or Become) Everything You Want! How to develop your "Negatives" into "Positives" and adopt a winning approach to life. A creative and light-hearted approach to Stress Management For Teens and Teachers. The Frightening Truth about Road Rage and Aggressive Driving and how to stay safe on the roadway. Learn key strategies to diffuse a hostile person and turn adversaries into allies. Read what people are saying about Janet Pfeiffer! Your recent presentation at our conference reflected you expertise, creativity, and dedication to the professional development of our members. You played an important role in inspiring educators to embrace new ideas and create new opportunities. I applaud your efforts and positive energies.